The four biggest days in gaming are back! Here are our top picks for excellent board games that are releasing at the fair. 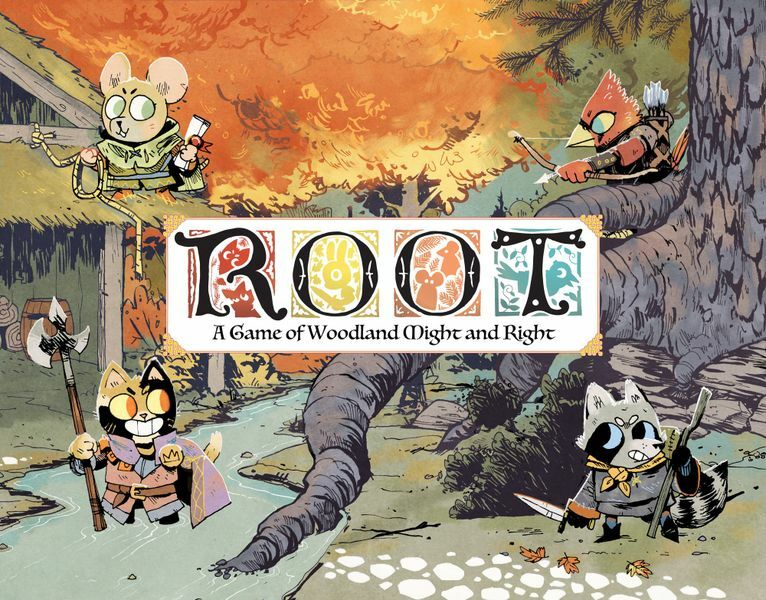 Root is an asymmetrical area control game in the vein of the Counter Insurgency (COIN) series of games from GMT; but more accessible, and with cute animals. Play as the central power, the Maquis de Cat; the Alliance of Woodland Creatures that oppose her, the raptors of the high-flying Eyrie, or the Vagabond who seeks to pit all the factions against each other for their own gain. 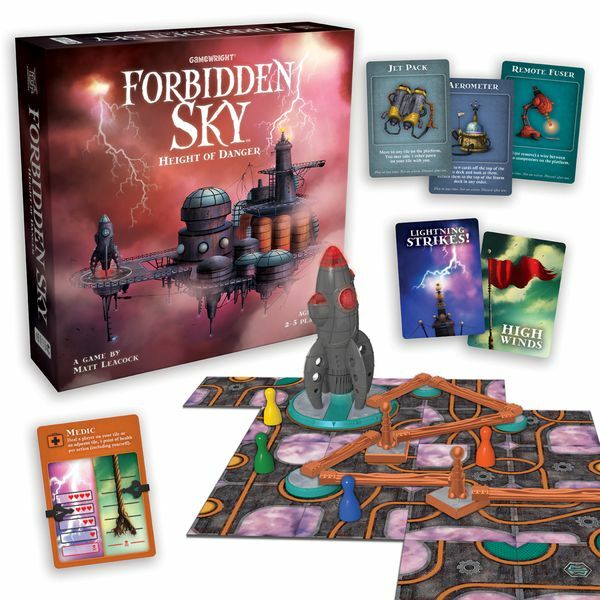 Soar to dizzying heights in the electrifying cooperative adventure board game Forbidden Sky: Height of Danger, the latest installment in Matt Leacock’s critically acclaimed Forbidden series following Forbidden Island and Forbidden Desert. Work as a team to explore a mysterious platform that floats at the center of a savage storm. Connect a circuit of cables to launch a secret rocket — all before you are struck by lightning or blown off to the depths below. It’s a high-wire act that will test your team’s capacity for courage and cooperation. One false step and you all could be grounded…permanently! 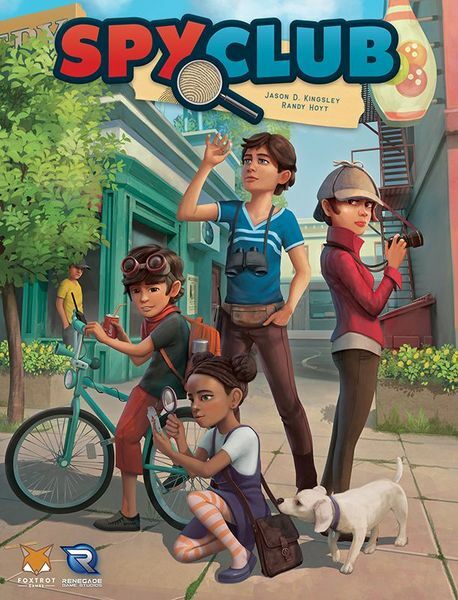 Spy Club is a co-operative board game of young detectives solving neighborhood mysteries with a replayable narrative campaign. Play through five cases and experience a different story each time in this mystery solving family game. Flip, draw, and trade clue gains, gain ideas, and confirm clue cards as evidence. Confirm 5 clues of the same type to solve part of the case. As you discover more and more of the solution, a story starts to emerge: your neighbor stole something from the ice cream shop, but what? And why? Are you afraid of the dark? Nyctophobia is a co-operative board game of being lost in the woods played completely blind – Players wear blackout glasses and must feel their way through the maze with only a stone for a weapon while they are hunted by a murderer with an axe – or a mage with mind-bending magic. Work together to communicate your location, make your way to the car, and don’t get lost – you might not hear the murderer before they’re right on top of you. Pre-order Nyctophobia as it arrives in stores. From Everfrost to Bellsong, many a year have come and gone, but the time has come for new territories to be settled and new cities established. You will be the leader of a group of critters intent on just such a task. There are buildings to construct, lively characters to meet, events to host—you have a busy year ahead of yourself. Will the sun shine brightest on your city before the winter moon rises? 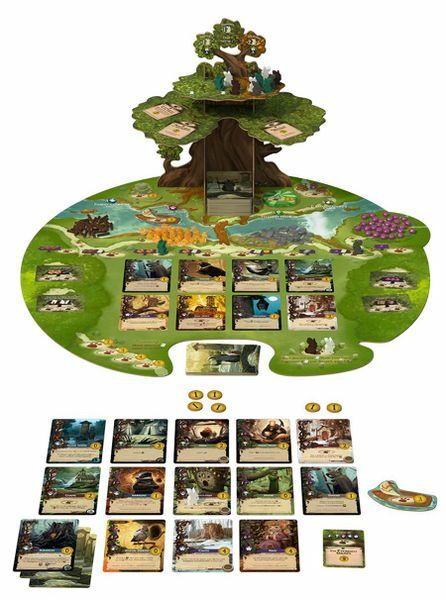 Buy Everdell for a beautiful board game of tableau building and worker placement where players use their animals to collect resources, prepare for seasons, and construct buildings to improve your city – all with a gorgeous three dimensional element and incredible illustration. Once every decade, the Cherry Tree would shroud itself in beautiful flowers during the first days of spring. Thousands of buds grew on its branches and stretched elegantly toward the sky, before becoming magnificent flowers of inestimable quality. 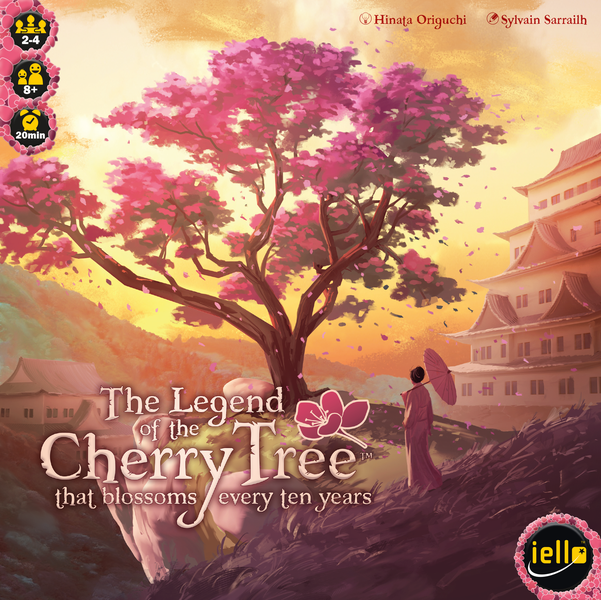 Buy The Legend of the Cherry Tree That Blossoms Every Ten Years for a light push your luck set collection game by collecting the right cherry blossoms to have matching sets, or going for a color majority. Pre-order TLotCTtBETY for under $20. From designer Ignacy Trzewiczek (Robinson Crusoe, Imperial Settlers) comes a new game of true crime and true detective work: Detective: A Modern Crime Board Game. Detective breaks the fourth wall by incorporating real-world knowledge into the game. Players must use Google Maps, web searches, Wikipedia, or any other source of knowledge in order to solve the cases – as well as a game-specific database accessible online filled with clues and info. Play through five story-connected cases and co-operate with your fellow agents with crack the case. 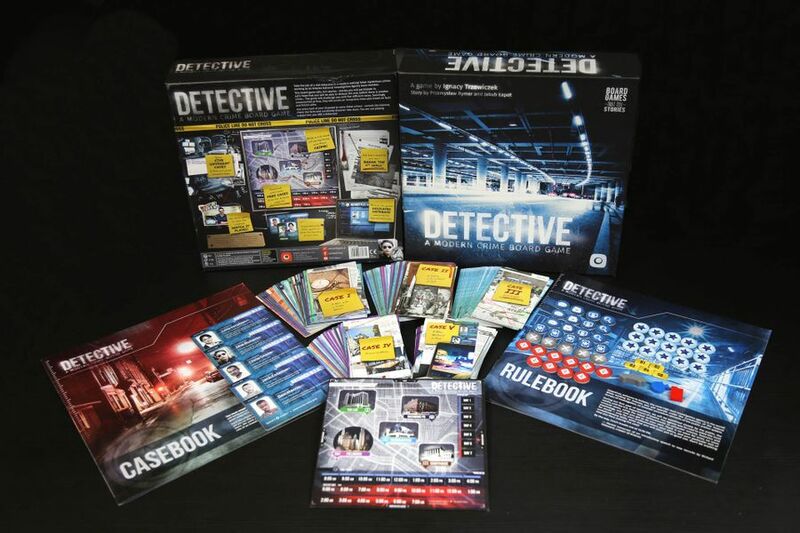 Buy Detective: A Modern Crime Board Game for a game where you are not playing a detective; you are a the detective. It’s the most sought-after invitation of the year: Dinoton Abbey for high tea. Now you’re all gussied up in your finery and ready for some tea and chit-chat. One problem: You can’t remember anyone’s name. Who’s that, sporting the fancy brooch with her pet chicken? Is that Jeannine? Beatriz? Oh, dear. If you’re not careful, you’ll commit a faux pas everyone will be gossiping about. 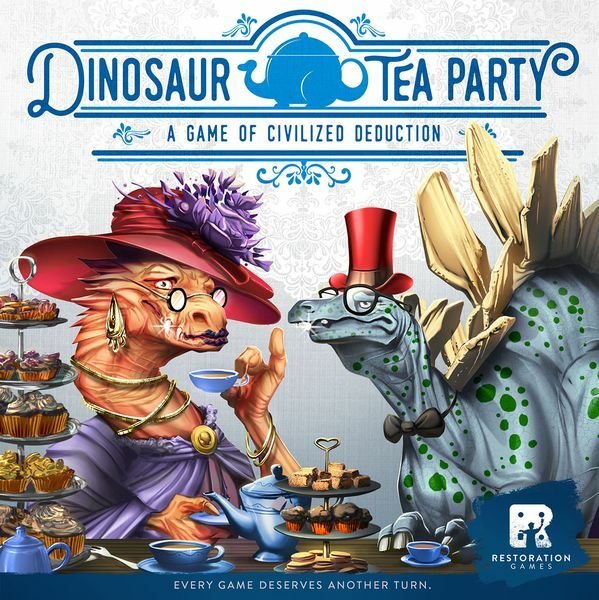 Dinosaur Tea Party is a game of pure deduction for 2-5 homo sapiens. Each player takes a card corresponding to one of the dino guests. Players take turns asking each other questions or guessing their dinosaur’s name. If someone guesses your name, draw a new card. The first player to guess three names, wins the game. 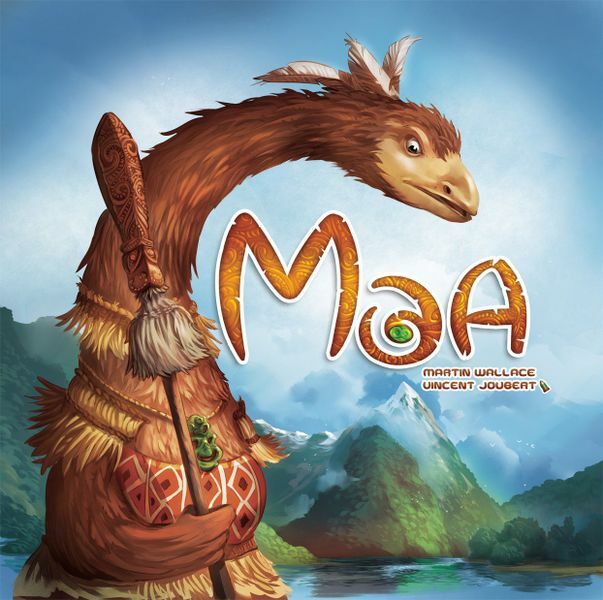 From designer Martin Wallace (Brass, Railways of the World) comes Moa, a game of the events surrounding the settlement of New Zealand, recasting them with anthropomorphized birds and mammals. The inhabitants of the Pacific island are represented by giant birds, such as the moa and kakapo, while the settlers from the west are played by dogs, rats, possums and weasels. Players take on the role of the defenders of the land, competing with their fellow players for control of the regions while staving off the advances of the mammals. However, the cunning bird may consider selling their land to the mammals rather than fighting to defend it. Scythe goes Legacy with a 8-episode campaign that tells the story of what happened after the Great War – or pick and choose from 11 new modules to add to your Scythe game experience. 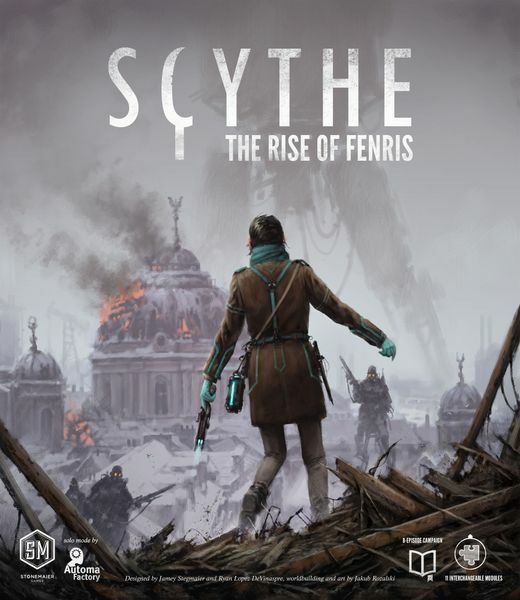 Buy Scythe: Rise of Fenris for the final expansion to Scythe, the game of rusted gears and broken hearts. As the mega corporations are getting ready to start the terraforming process, you now have the chance to make those early choices that will come to define your corporation and set the course for the future history of Mars – this is the prelude to your greatest endeavors! 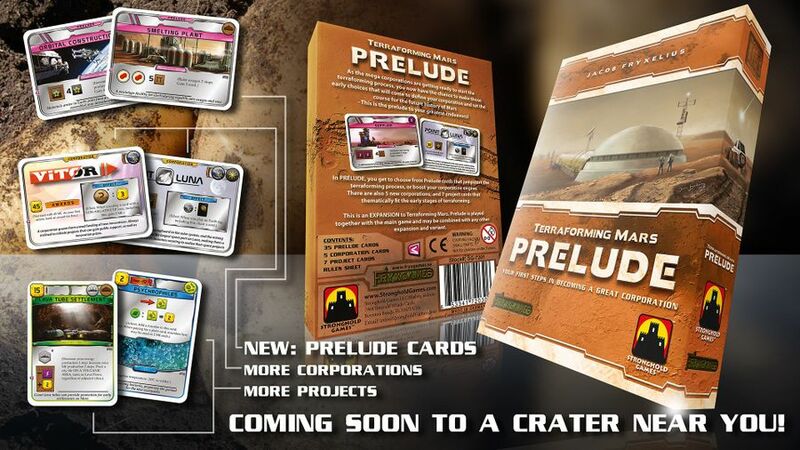 Buy Prelude to expand your Terraforming Mars collection, whether combined with any other Terraforming Mars expansion or variant or just by itself. You’ve rolled your characters, now it’s time to fight! An abomination of a beast is terrorizing villages throughout the kingdom, leaving behind a path of death and destruction. The lord has summoned all able-bodied adventurers to return to the capitol and organize a plan to rid the kingdom of this menace. 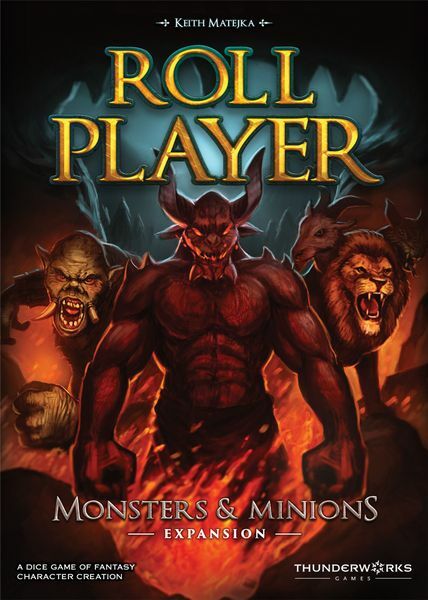 In the Roll Player: Monsters & Minions expansions, players must gather information about the monstrous threat looming, and prepare for a final showdown against the beast. The more prepared the adventurers are for the battle, the better they’ll do, but that information doesn’t come for free. Listen for rumors to gather details for the fight ahead. Where is its lair? What obstacles will there be along the way? What will its next strike be? Players earn Reputation Stars by constructing the perfect character, as well as driving back the evil of the monster and its minions. The player with the greatest Reputation wins the game and becomes the heir to the kingdom! Thanks for reading! Check out the rest of our Gen Con 2018 Top Picks here, including such games as Founders of Gloomhaven, Arboretum, and My Little Scythe!